A pulsar (pink) can be seen at the center of the galaxy Messier 82 in this multi-wavelength portrait. 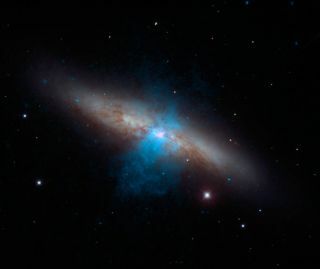 The pulsar was discovered by NASA's NuSTAR which detected the pulsar's X-ray emission. Pulsars are spherical, compact objects that are about the size of a large city but contain more mass than the sun. Scientists are using pulsars to study extreme states of matter, search for planets beyond Earth's solar system and measure cosmic distances. Pulsars also could help scientists find gravitational waves, which could point the way to energetic cosmic events like collisions between supermassive black holes. Discovered in 1967, pulsars are fascinating members of the cosmic community. From Earth, pulsars often look like flickering stars. On and off, on and off, they seem to blink with a regular rhythm. But the light from pulsars does not actually flicker or pulse, and these objects are not actually stars. Pulsars radiate two steady, narrow beams of light in opposite directions. Although the light from the beam is steady, pulsars appear to flicker because they also spin. It's the same reason a lighthouse appears to blink when seen by a sailor on the ocean: As the pulsar rotates, the beam of light may sweep across the Earth, then swing out of view, then swing back around again. To an astronomer on the ground, the light goes in and out of view, giving the impression that the pulsar is blinking on and off. The reason a pulsar's light beam spins around like a lighthouse beam is that the pulsar's beam of light is typically not aligned with the pulsar's axis of rotation. This diagram of a pulsar shows the yellow cone of light that can be seen by astronomers on Earth. The cone is not aligned with the spin axis, which is why the beam sweeps across the sky instead of pointing in just one direction. Because the "blinking" of a pulsar is caused by its spin, the rate of the pulses also reveals the rate at which the pulsar is spinning. Over 2,000 pulsars have been detected in total. Most of those rotate on the order of once per second (these are sometimes called "slow pulsars"), while more than 200 pulsars that rotate hundreds of times per second (called "millisecond pulsars") have been found. The fastest known millisecond pulsars can rotate more than 700 times per second. Pulsars aren't really stars — or at least they aren't "living" stars. Pulsars belong to a family of objects called neutron stars that form when a star more massive than the sun runs out of fuel in its core and collapses in on itself. This stellar death typically creates a massive explosion called a supernova. The neutron star is the dense nugget of material left over after this explosive death. Neutron stars are typically about 12.4 to 14.9 miles (20 to 24 kilometers) in diameter, but they can contain up to twice the mass of the sun, which is about 864,938 miles (1.392 million km) in diameter. A sugar-cube-size bit of material from a neutron star would weigh about 1 billion tons (0.9 metric tons) — "about the same as Mount Everest," according to NASA. The gravitational pull on the surface of a neutron star would be about 1 billion times stronger than the gravitational pull on the surface of the Earth. The only object with a higher density than a neutron star is a black hole, which also forms when a dying star collapses. The most massive neutron star ever measured is 2.04 times the mass of the sun. Scientists don't know exactly how massive neutron stars can get before they become black holes, according Feryal Özel, a professor of astronomy and astrophysics at Arizona State University, who specializes in compact objects and extreme states of matter in the universe. Pulsars are neutron stars are also highly magnetic. While Earth has a magnetic field that's just strong enough to exert a gentle tug on a compass needle, pulsars have magnetic fields that range from 100 million times to 1 quadrillion (a million billion) times stronger than Earth's. "For a neutron star to emit as a pulsar, it has to have the right combination of magnetic field strength and spin frequency," Ozel told Space.com in an email. Some neutron stars may have once radiated as pulsars, but no longer radiate (read more below). Ozel also noted that the beam of radio waves emitted by a pulsar may not pass through the field of view of an Earth-based telescope, preventing astronomers from seeing it. The slowest pulsars ever detected spin on the order of once per second, and these are typically called slow pulsars. The fastest known pulsars can spin hundreds of times per second, and are known as fast pulsars or millisecond pulsars (because their spin period is measured in milliseconds). Pulsars are the size of small cities, so ramping them up to such high speeds is no small feat. In fact, millisecond pulsars require an additional source of energy to get going to such a high rotation rate. Scientists think millisecond pulsars must have formed by stealing energy from a companion. The pulsar siphons matter and momentum from its companion, gradually increasing the spin rate of the pulsar. This is bad news for the companion star, which may be completely devoured by the pulsar. This would explain why millisecond pulsars have been discovered with no visible companion nearby. Systems where scientists see a pulsar sucking the life from a star are called black widow stars or redback stars, named after two types of dangerous (life-sucking) spiders. An artist's impression of a pulsar syphoning material away from a companion star, leading to the formation of a millisecond pulsar. What makes a pulsar radiate? Pulsars can radiate light in multiple wavelengths, from radio waves all the way up to gamma-rays, the most energetic form of light in the universe. How do pulsars radiate light? Scientists don't yet have a detailed answer to that question, according to Alice Harding, an astrophysicist at NASA's Goddard Space Flight Center in Greenbelt, Maryland, who specializes in pulsars. What's more, scientists have found that different mechanisms are likely responsible for producing different wavelengths of light from the area above the pulsar's surface, Harding said. The lighthouse-like beams of light that scientists first spotted in the 1960s consist of radio waves. These beams of light are notable because they are extremely bright and narrow, and have properties similar to those of a laser beam. Laser light is "coherent," as opposed to non-coherent light radiated by, for example, a light bulb. In a beam of coherent light, the particles of light are essentially marching in step, creating a uniform, focused beam. When particles of light work together in this way, they can produce a beam of light that is exponentially brighter than a diffuse light source using the same amount of power. What does seem clear to scientists is that pulsar emissions are powered by the pulsar's rotation and its magnetic field, according to Roger Romani, a professor of physics at Stanford University who studies pulsars and other compact objects. The fastest-spinning pulsars have weaker magnetic fields than slower spinning pulsars do, but the increase in rotation speed is still enough to cause those fast pulsars to radiate similarly bright beams to those of slower pulsars, Romani said. An artist's impression of magnetic-field lines looping around a pulsar. The purple glow represents gamma-ray light. The axis of the pulsar's rotation is not shown, and would not be aligned with the magnetic-field axis. The artist's impression above provides an idea of how the magnetic-field lines from a pulsar will loop around it and connect at the two poles. However, in reality, as the pulsar spins, it whips the magnetic field around with it, creating a much more tangled picture. A spinning magnetic field generates an electric field, which, in turn, can cause charged particles to move (creating an electric current). The region above the surface of the pulsar that is dominated by the magnetic field is called the magnetosphere. In this region, charged particles like electrons and protons, or charged atoms, are accelerated to extremely high speeds by the very strong electric field. Any time charged particles are accelerated (meaning they either increase their speed, or change direction), they radiate light. On Earth, instruments called synchrotrons accelerate particles to very high speeds and use the light they radiate for scientific studies. In the pulsar's magnetosphere, this basic process may generate light in the optical and X-ray range. But what about the gamma-rays emitted by a pulsar? Observations show that gamma-rays are emitted from a different location in the space surrounding the pulsar than the beams of radio waves, and at a different altitude above the surface, Harding said. And, rather than in a narrow, pencil-like beam, gamma-rays are emitted in a fan shape. But just as with radio wave emissions, scientists are still debating the exact mechanism responsible for generating gamma-rays from a pulsar. Scientists discovered pulsars by using radio telescopes, and radio continues to be the primary means of hunting these objects. Because pulsars are small and faint compared to many other celestial objects, scientists find them using all-sky surveys: A telescope scans the entire sky, and over time, scientists can look for objects that flicker in and out of view. The Parkes radio telescope in Australia has found the majority of known pulsars. Other telescopes that have made major contributions to pulsar searches are the Arecibo radio telescope in Puerto Rico, the Green Bank Telescope in West Virginia, the Molonglo telescope in Australia, and the Jodrell Bank telescope in England. Thousands of new pulsars may be detected by two radio survey telescopes that are scheduled to start taking data in the next five years, according to Scott Ransom, a staff astronomer at the National radio Astronomy Observatory (NRAO) in Charlottesville, Virginia. The telescopes are China's Five Hundred Meter Aperture Spherical Telescope (FAST for short), for which basic construction may be completed as early as September 2016, and the Square Kilometer Array (SKA), funded by a consortium of countries. Construction on the SKA is set to begin in 2018, with locations in both South Africa and Australia. The organization's website says early science observations could begin in 2020, but the array would not reach full science operations (both facilities) until 2030. The Fermi Gamma-ray Space Telescope, launched in June 2008, has detected 2,050 gamma-ray-emitting pulsars, including 93 gamma-ray millisecond pulsars. Fermi has been particularly helpful because it scans the entire sky, whereas most radio surveys typically scan only sections of the sky along the plane of the Milky Way galaxy. A map of the sky showing gamma-ray pulsars detected with the LAT instrument on the Fermi Gamma Ray Telescope. Shown above are the gamma-ray pulsars detected with the LAT: CGRO PSRs (plus), young radio-selected (circle), young gamma-selected (square), and MSPs (diamond). Detecting different wavelengths of light from a pulsar can be difficult. A pulsar's beam of radio waves might be very powerful, but if it doesn't sweep across the Earth (and enter a telescope's field of view), astronomers may not see it. The gamma-ray emission from a pulsar may fan across a larger area of the sky, but it also can be dimmer and more difficult to detect. As of March 22, 2016, scientists know about 2,300 pulsars for which only radio waves have been detected, and about 160 pulsars that radiate gamma rays. Scientists now know of 240 millisecond pulsars, 60 of which radiate gamma rays, Ransom said. These numbers change frequently as new pulsars are discovered. Pulsars are fantastic cosmic tools for scientists to study a wide range of phenomena. The light emitted by a pulsar carries information about these objects and what is happening inside them. That means pulsars give scientists information about the physics of neutron stars, which are the densest material in the universe (with the exception of whatever happens to matter inside a black hole). Under such incredible pressure, matter behaves in ways not seen before in any other environment in the universe. The strange state of matter inside neutron stars is what scientists call "nuclear pasta": Sometimes, the atoms arrange themselves in flat sheets, like lasagna, or spirals like fusilli, or small nuggets like gnocchi. Some pulsars also prove extremely useful because of the precision of their pulses. There are many known pulsars that blink with such precise regularity; they are considered the most accurate natural clocks in the universe. As a result, scientists can watch for changes in a pulsar's blinking that could indicate something happening in the space nearby. It was with this method that scientists began to identify the presence of alien planets orbiting these dense objects. In fact, the first planet outside Earth's solar system ever found was orbiting a pulsar. Because pulsars are moving through space while also blinking a regular number of times per second, scientists can use many pulsars to calculate cosmic distances. The changing position of the pulsar means the light it emits takes more or less time to reach Earth. Thanks to the exquisite timing of the pulses, scientists have made some of the most accurate distance measurements of cosmic objects. Pulsars have been used to test aspects of Albert Einstein's theory of general relativity, such as the universal force of gravity. The regular timing of pulsars also may be disrupted by gravitational waves — the ripples in space-time predicted by Einstein and directly detected for the first time in February 2016. There are multiple experiments currently searching for gravitational waves via this pulsar method. Using pulsars for these types of applications depends on how settled they are in their rotation (thus providing very regular blinks), Ransom said. All pulsars are slowing down gradually as they spin; but those used for precision measurements are slowing down at an incredibly slow rate, so scientists can still use them as stable time-keeping devices. These images of the Crab Pulsar, taken by the Chandra X-ray Observatory over several months, show the bright white pulsar at the center, and jets of matter spewing away. All pulsars slow down gradually as they age. The radiation emitted by a pulsar is jointly powered by its magnetic field and its spin. As a result, a pulsar that slows down also loses power, and gradually stops emitting radiation (or at least, it stops emitting enough radiation for telescopes to detect), Harding said. Observations thus far suggest that pulsars drop below the detection threshold with gamma-rays before radio waves. When pulsars reach this stage of life, they enter what's known as the pulsar graveyard. (Pulsars that have stopped emitting may be considered ordinary neutron stars by astronomers). When a pulsar forms from the wreckage of a supernova, it spins fast and radiates a lot of energy, Ransom said. The well-studied Crab Pulsar is an example of such a young pulsar. This phase may last for a few hundred thousand years, after which the pulsar begins to slow down and only emit radio waves. These "middle-age" pulsars likely make up most of the population of pulsars identified as emitting only radio waves, he added. These pulsars live for tens of millions of years before eventually slowing down so much that they "die" and enter the pulsar graveyard. But if the pulsar sits near a stellar companion, it may be "recycled," meaning it siphons material and energy from its neighbor, increasing its spin to hundreds of times per second — thus creating a millisecond pulsar, and giving the once-dead pulsar new life. This change can occur anytime in a pulsar's life, meaning a "dying" pulsar's rotation rate can increase over hundreds to millions of years. The pulsar begins to emit X-rays, and the pair of objects is known as a "low-mass X-ray binary," Ransom said. (These cannibalistic pulsars have been called "black widow" pulsars or "redback" pulsars in reference to two species of spider that are known to kill their companions). Millisecond pulsars are the oldest known pulsars — some are billions of years old and will continue to spin at those high rates for billions of years.